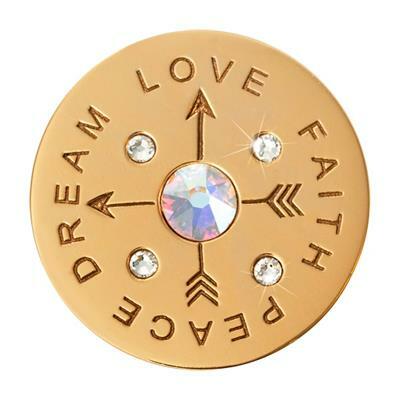 Let this beautiful Nikki Lissoni coin guide you on the right path & bring inspiration to your day. This yellow gold plated coin adds meaning to your necklace with the words 'Dream Love Faith Peace' engraved. A compass design is embellished at the centre with sparkling Swarovski crystals. This stunning 33mm coin fits the medium size carrier, mix up your look and alternate between a silver and gold carrier for a stunning accessory for any occasion.